One of the things you always find strange about a new culture is the food. In Colombia, I didn´t really encounter much food that I thought was strange (other than tongues and intestines... not my thing), so that was lucky for me. One thing that I will always cherish about my time in Colombia is the abundance of fruits! All the typical tropical favourites such as mango, guava, papaya, watermelon and pineapple are available and taste a million times better than the same fruits I have eaten in other countries. The surprise I wasn´t prepared for was falling in love with fruits that are found only in Colombia (and some that are found in just a few other countries). My favourites include granadilla (an orange fruit in the same family as passion fruit), lulo (which makes the most delicious juice known to humankind), pitahaya (yellow dragonfruit), feijoa (pineapple guava), uchuva (gooseberry), and my personal favourite, guanabana (sour sop). There are many more, but these are the main ones that I consumed on a regular basis as they were very common and you could even get them in juices for about a dollar anywhere in the city. 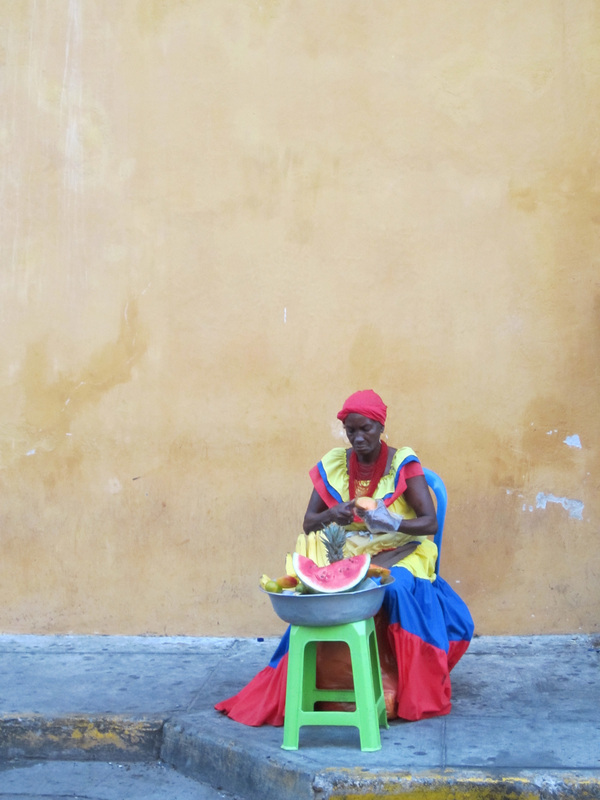 The photo on the right is one I took in Cartagena, of a woman dressed in traditional clothing. These women walk around the streets with that basket on their heads and sell fresh fruits. They are always a welcome site and their fresh Colombian fruits are a refreshing treat. Of course, MET has provided me with much food for thought, which often complemented my exotic fruit smoothie I was already consuming. ETEC 510: Design of Technology Supported Learning Environments was one of those courses that provided much food for thought as it was designed to take theory into practice. We were challenged to explore how we could apply learning theories to our own classrooms and technological environments. There is always a need to feed ourselves with the latest technologies, but this must be done with a pedagogical purpose in mind. This was the entire focus of this course. How do we use everything we know about learning theories and apply this in real life situations while using technology? The question itself creates a series of additional questions, none with an easy answer. As a small group assignment we were tasked with creating our own online learning platform and we came up with Thinkspace. The fact that it was a group assignment helped me to explore options and think of the educational value of learning platforms and online networks that I might not have otherwise examined. Trying new things as suggested by other group members was a great experience! Other courses also offered plenty of food for thought. Some offered exotic food for thought to take me more outside of my comfort zone and some offered more traditional comfort food for thought. I created a few thought papers after consuming the content for ETEC 512: Applications of Learning Theories to Instruction. I have included one of those here as well. I really enjoyed exploring the connection between theories and practice and examining ways to make the two work together. This is something that I hope to continue in my years as a teacher and I am sure that my students and colleagues will benefit from it as well. In ETEC 522: Venture in Learning Technology we explored the different new technology ventures that might possibly end up in an educational setting. The opportunities are endless. 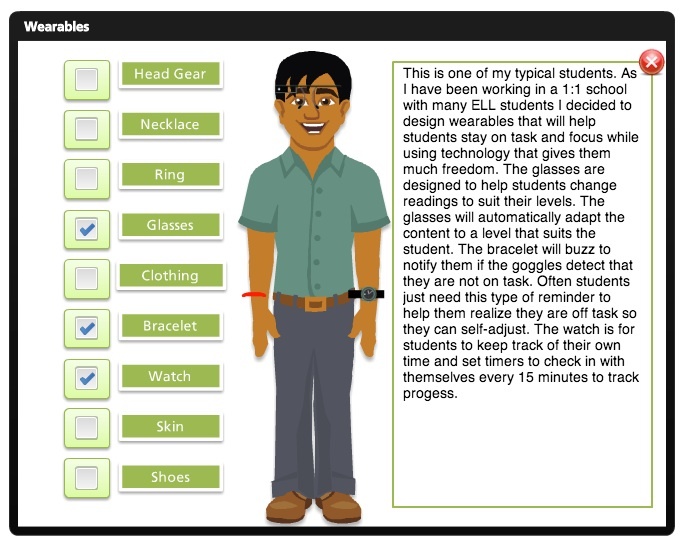 This was an activity for one group´s Open Educational Resource on Wearables. We were tasked with thinking of how technology could aid in differentiation for learning needs and styles of our diverse student bodies. It was extremely interesting to think about the possibilities technology offers to help us aid in student learning that is tailored to each individual´s unique needs and desires. While many of the ideas we came up with are not possible because of limitations of current technology, it was an exciting course to take because it allowed us to think as a designer, inventor or teacher about how learning technologies could be developed to improve education.